A large American multinational automaker required a comprehensive solution to optimally process data and enable integration with various partner web services. Since the company interacted with several business partners, they faced challenges with data processing from disparate systems in multiple formats. 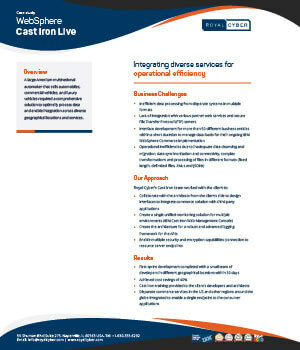 Royal Cyber leveraged WebSphere Cast Iron Live to enhance the client’s data processing and integration with other servers while enabling better operational efficiency and security.